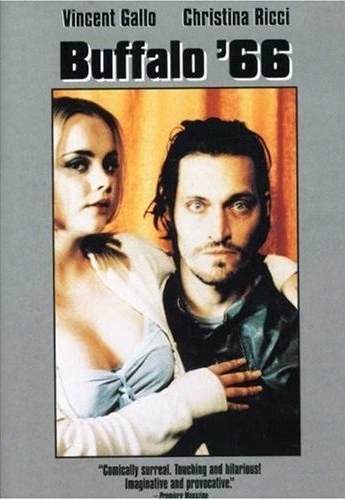 Writer-director-composer Vincent Gallo and Christina Ricci star in this quirky and deliberately grimy little movie. Gallo plays Billy Brown, recently released from prison and unable to find so much as a decent bathroom in his cold hometown. Billy's parents are unaware that he's been locked up; in a pathetic attempt to impress them with how successful he's become, he hits on the novel plan of kidnapping young dance student Layla (Ricci) and forcing her to play the role of his wife. Billy's distant--to say the least--parents are played to the hilt by Anjelica Huston and Ben Gazzara, Huston in particular bringing a demented glee to her role as Billy's football-obsessed mother. As the movie unfolds, we learn more about Billy's tormented childhood and unfortunate tendency to bet on the Bills in the Super Bowl. Gallo boldly throws himself into the task of playing a complete sleazebag, and Ricci does lovely standout work as the one ray of hope in the grinding darkness of Billy's life. This odd little love story is just the thing to make you feel better about your own relationship--especially if you're not in one.